You can even modify it to be [slightly] healthier, just increase the pumpkin by a quarter cup and reduce the oil by the same amount. However, please note that they will be breadier and less crisp than the version below. These waffles aren’t very sweet on their own, but once paired with a drizzle (or generous glug) of pure, Grade B¹ maple syrup (or your favorite variety, it’s ok, I won’t judge — former Aunt Jemima Light fan here) it’s just right; any more sugar and the combo would border on cloying. And for a really complete meal, throw in a few slices of thick-cut, applewood smoked bacon (Whole Foods or Trader Joe’s both sell some great choices) or several breakfast sausage links (I’m still loving these from Fra’Mani) and a pear, you know, to balance things out. Now that’s a breakfast I’d love to wake up to on a chilly fall morning, and certainly a good use of the extra hour we get this weekend (hey David, are you taking notes?). In a large bowl, whisk together millet flour through pumpkin pie spice. Combine egg yolks, milk, canola oil, pumpkin purée and brown sugar in a four cup measuring cup or small bowl. In a separate, small bowl, beat egg whites with a balloon whisk or hand mixer until stiff, glossy peaks form. Whisk egg yolk mixture into flour; whisk until lump-free and slightly thickened, about 15 to 30 seconds. Gently fold whipped egg whites into flour mixture (I like to use a silicone spatula/rubber scraper, such as this one). Bake as directed by your waffle iron. (For mine, each batch takes about 1 cup batter and bakes up to crispy perfection in 5 minutes.) Serve immediately or transfer to a warm oven (200°F) to keep warm. 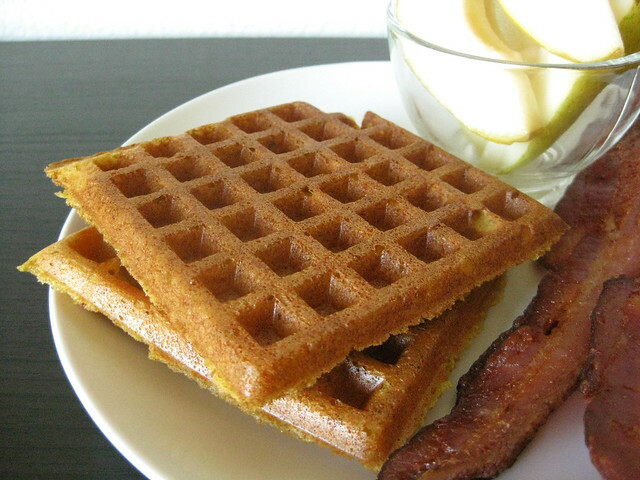 Waffles may also be cooled in a single layer on cooling racks, then frozen. Reheat straight from the freezer in a toaster (make sure it’s not contaminated by gluten) or directly on the [clean!!] center rack of a 350°F oven for about 4 minutes. ² I use Trader Joe’s pumpkin pie spice — besides the usual ingredients, it also includes some citrus peel and cardamom. Not a huge deal if you can’t find it, just use your favorite blend! ³ I’ve used 1% and Whole Milk with equal success. Thank you! They are incredibly easy, to boot. My recipe is merely a few modifications to the classic Better Homes and Gardens recipe (simply add a tablespoon of pumpkin pie spice, reduce the milk by 1/4 cup, add 1/2 cup pumpkin and 2 tablespoons dark brown sugar). Cause really, breakfast, regardless of the day, should not be the time for a lot of thinking and dishes, right? I don’t think I would have paid attention to the link except for your comment, so thank you. Not only did I learn how to make delicious waffles, but I learned some a bit of American history today too. Samuel: Wow, what an interesting article. I had no idea just how extensive the history of maple syrup is, or that the Grade B designation may soon be a thing of the past. My taste for B has developed over the years from a few Vermont sugar shack tours and syrup samplers (such as these — I see the top right one from time to time at Marshalls). Thank you so much for sharing — I absolutely love reading this sort of article!